The term Bacchanalia describes the initiatory and celebratory rites dedicated to the Roman god Bacchus (a variant of the Greek Dionysus). These practices, which were intimately tied to the soteriological aspirations of their adherents, were largely inherited from Greek and Etruscan mystery religions, save their notable incorporation of carnality (through the use of inebriation and sexual license). Though extant on the Italian peninsula since approximately 600 B.C.E., these practices began to truly flourish during the third and second centuries B.C.E. The dramatic increase in the popularity of these rites, coupled with the fact that they encouraged the involvement of various "lesser" citizens (such as slaves, women, and youths), led the Roman Senate to pass an edict banning all unauthorized worship of Bacchus in 186 B.C.E. 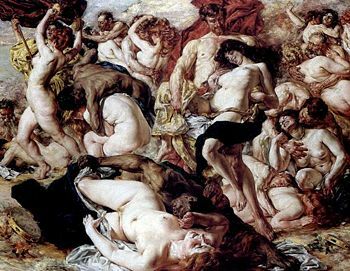 The derogatory and potentially fallacious descriptions of the Bacchanalia that abound in classical materials (such as the writings of Livy) have caused the term to become synonymous with heedless corporeal excess—a connotation that may or may not be true to the original religious context. Bacchus was the Roman characterization of the Greek Dionysus, a deity who represented the power of intoxication and ecstasy (literally "being outside the self"). He was known as the Liberator (Greek: Eleutherios/ Latin: Liber), freeing individuals from their day-to-day lives through drunkenness, madness, or artistic expression. Paradoxically, he was also viewed as the promoter of civilization, a lawgiver, and lover of peace—as well as the patron deity of agriculture and the theatre. The divine mission of Dionysus was to bring an end to care and worry. Bacchus/Dionysus was an important figure in the religious imagination of the Greeks and Romans, as he was thought to represent the union between the realms of the living and the dead (as per the two mythic stories of his death and rebirth). This chthonic role was especially pronounced in Roman religion, which spurred on the development of the Bacchanalia—a rebirth/renewal festival with a basis in the Greek mystery religions. 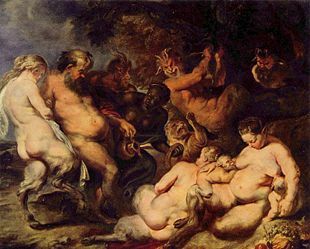 As noted above, the bacchanalia were the ecstatic, mystical festivals central to the cult of Bacchus introduced into Rome from lower Italy by way of Etruria (c. 200 B.C.E.). Here, Dionysos was merged with the local fertility god Liber, the personification of joyous personal freedom. The Roman Bacchic Cult typically emphasized the sexual aspects of the religion, and invented terrifying, chthonic ordeals for initiation into its Mysteries. These festivals, which included both cultic initiations and general revelry, occurred on March 16 and 17, in the grove of Simila near the Aventine Hill and were generally restricted to female participants. Archaeological findings reveal that Dionysus or Bacchus, as he was called by the Romans, was known and popular in Italy as early as the sixth century. Evidence shows that Bacchic rites of initiation were a form of private, not public, worship and were often performed informally by small local or family organizations. The emphasis of the ceremonies was preparation for an afterlife of punishments and/or bliss. By the end of the third or early second century, the cult had taken on the fervor of a religious missionary movement. The initiated held secret meetings and had secret signs by which they recognized each other, and changes were made to the initiation ceremonies, or Bacchanalia. Wine-drinking and feasting were added to the religious component, which led to ecstatic fanaticism and the practice of scandalous behavior. At first, the rites were imparted to a few, but soon they were propagated widely in order to gain many adherents. Though the cult was forcibly constrained by governmental fiat (as described below). It was revived in a slightly tamer form under Julius Caesar around 50 B.C.E., with his one time ally, Mark Anthony, becoming an enthusiastic devotee and lending the movement much popular support in the process. The Bacchanalian festivals, which were popular enough to be exported to most Romanized provinces, remained in existence, along with their carnivalesque street processions, until at least the time of Saint Augustine (c. 400 C.E.). When conducted under Roman auspices, the festival had earlier been confined to women, but in the grove of Stimula young men were being initiated into the cult, and there were allegations of both heterosexual and homosexual license. Though previously restricted to three days a year, the ceremonies were now being conducted five times a month; moreover, the proceedings were being held in darkness. Allegations of dire misconduct were circulating, including charges of murder of unwilling initiates, forging of the wills of the dead, and perjury. The rising climate of public hysteria concerning these "immoral" and "dangerous" practices (in addition to concerns that the initiates were using these meetings to hatch political conspiracies) led to an emergency meeting of the Roman Senate—the so-called Senatus consultum de Bacchanalibus—that issued an edict prohibiting unauthorized Bacchanalian observances throughout all of Italy, in 186 B.C.E. In spite of the severe punishment inflicted on those found in violation of this decree (Livy claims there were more executions than imprisonment), the Bacchanalia survived in Southern Italy long past the repression. In Livy's narrative, the cult of Bacchus represents disorder and madness while the state represented by the (all male) Senate stands for order and sanity. The account stresses moral and even sexual debaucheries committed by Bacchants. If we had only Livy's narrative we would conclude that the Roman Senate feared and reacted against the cult for the same reasons as Euripides' Pentheus. The inscription from Tiriolo, however, points to a political reason: the Senate wanted control over the cult and demonstrated its political power over all of Italy. In Rome, where politics and religion were intertwined, such control belonged traditionally to the ruling elite and in the case of Bacchic worship senatorial control over the cult needed to be established. There was a desire to curb Hellenistic influences on public life, a zeal to subdue, bring into line, and structure a "foreign" cult. Or, in terms of power, Rome reigned supreme over her immediate neighbors and allies. The high number of executions leaves me with the feeling, though, that in 186 B.C.E., as it happens too often in human history, religion served as a smoke-screen. That those who were singled out for undermining the ruling authority, Rome, were executed not for their participation in a cult but so that a political order could prevail. ↑ M. P. Nilsson, The Dionysiac Mysteries of the Hellenistic and Roman Age (Lund: Gleerup, 1957). Fox, William Sherwood. The Mythology of All Races. 1916. Henrichs, Albert. "Greek Maenadism from Olympias to Messalina." Harvard Studies in Classical Philology 82 (1978): 121-160. Kraemer, Ross S. "Ecstasy and Possession: The Attraction of Women to the Cult of Dionysus." The Harvard Theological Review 72:1/2 (1979): 55-80. Stewart, Zeph. "The God Nocturnus in Plautus' Amphitruo." The Journal of Roman Studies 50: Parts 1 and 2 (1960): 37-43. Takács, Sarolta A. "Politics and Religion in the Bacchanalian Affair of 186 B.C.E." Harvard Studies in Classical Philology 100 (2000): 301-310. Senatus consultum de Bacchanalibus in Latin at The Latin Library. Senatus Consultum de Bacchaniabus in English and Latin at forumromanum.org. Description of the Bacchanalia and the Senate's ruling from Fordham. This page was last modified on 5 May 2016, at 14:32.